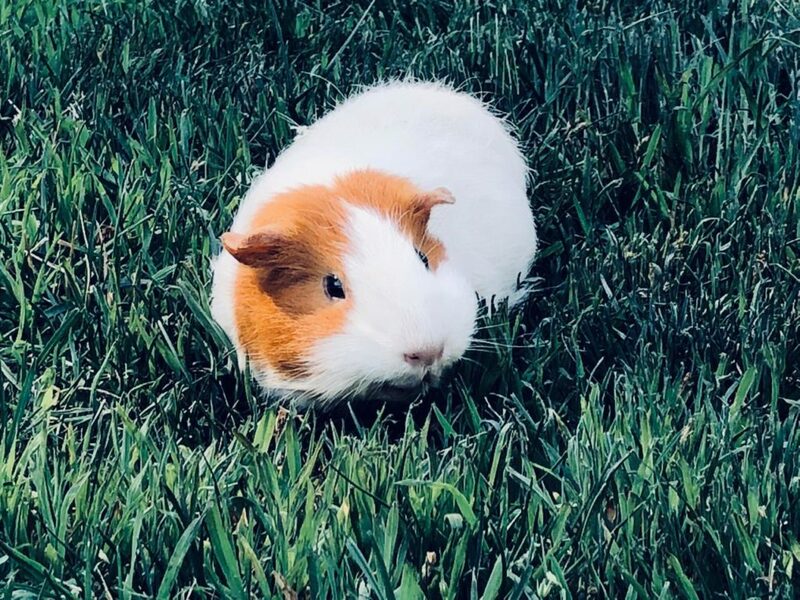 Our guinea pig passed away this week. She was 10, which is ancient for a guinea pig. Google tells me the average life expectancy is 4-8, so she well exceeded that. She fought hard and was relatively healthy and normal right up until her final afternoon, but alas, the reaper man finally came a-knockin’. Ten years is a long time. It’s long enough for things to change. Big things, small things. In our case, basically everything. The guinea pig came into our lives when we were still in our 20s, the apex of youth, and sailed with us straight through into our 30s. Not necessarily “old”, but the beginning of old. Oldish. Two apartments, a condo, and our first home. She was with us through it all. Quite a journey. She had an interesting personality. She wasn’t a huge fan of being doted upon– it became clear very early on that excessive manhandling didn’t bring her a great deal of joy. She liked her home, a massive enclosure that, looking back on it now, took up such a disproportionate amount of our tiny apartment square footage. She loved her carrots, apples, and oranges. She knew the fridge was the source of all this produce, and a strong Pavlovian response set in– open fridge, loud and persistent whistles from her. It became part of the sound of home for me. She loved the little kids who would come to visit, a parade of nieces and nephews. I think their small size and excitement genuinely brought her enjoyment. She was good natured, never a bite or even a nibble. Yet she had an air of not being a fool. Sounds crazy, I know, but I’m telling you…I lived with this creature for a long time and she had a distinct haughty vibe all her own. This was a slightly aristocratic guinea pig. Ten years is certainly enough time for a living thing to become woven into the tapestry of your life. Their sounds, their movements, their needs, their routines- they all become part of your own routine. I didn’t quite realize how much so until this week. Her absence is deafening. All her stuff, now gone, has left an enormous hole. A missing piece. It’s very strange. Her first and only vet visit came two years ago. The vet said there was nothing to be done with an animal of such an advanced age. I tended to her, tweaked her diet with care, and her health issues subsided. She returned to being her normal self. She got two more quality years beyond that. Summers in the fresh cut lawn. Halloween with fun decorations. Christmas with a house full of guests. And so on. The older I get, the more those little cyclical traditions rooted in nonsense become meaningful. Little buoys to cling to in the cold water. I’m glad she was there with us for all of that. She was with us for so long and for so many of those little buoy moments, and all the unremarkable days in-between, that I foolishly began to think of her as immortal. She was a permanent fixture, part of the standard kit that made up our life. Like the clown painting in Jim’s parent’s house in the Office. The Highlander guinea pig. The end, the true end, wasn’t protracted. It arrived like a bolt late one afternoon earlier this week. The morning was normal, but by that afternoon a sort of internal countdown suddenly clicked on, as if set on an egg-timer, and the spiral began. I knew it was the end when I held her– I could feel an unnatural lightness that had not existed just a day before. That evening, I cradled her and gave her comfort. I shed some tears. You can know it’s coming for years, but when the moment arrives it does so with such unexpected force. The train pulls up to the station, and there’s little more you can do but wave goodbye. As I laid her down inside her home for the night, I knew it would be the last moments we would share. The last moments of an unbelievably long string of moments– thousands of days, a partial lifetime. I woke up at 5 the next morning, and she had passed. She hadn’t moved from the spot I set her down in. I was mentally prepared for her passing– the math was clear. But the mind is just one tiny facet of our being, and a faulty one at that. As life ticks along, these moments of grief and loss open rare doors to all the other things that make us up. There’s pain, but also an overwhelming rush of love. We loved her. I’m pretty sure she loved us too. Or at least our carrots. We were spoiled to have her in our lives as long as we did. RIP Ginny. You were the best. 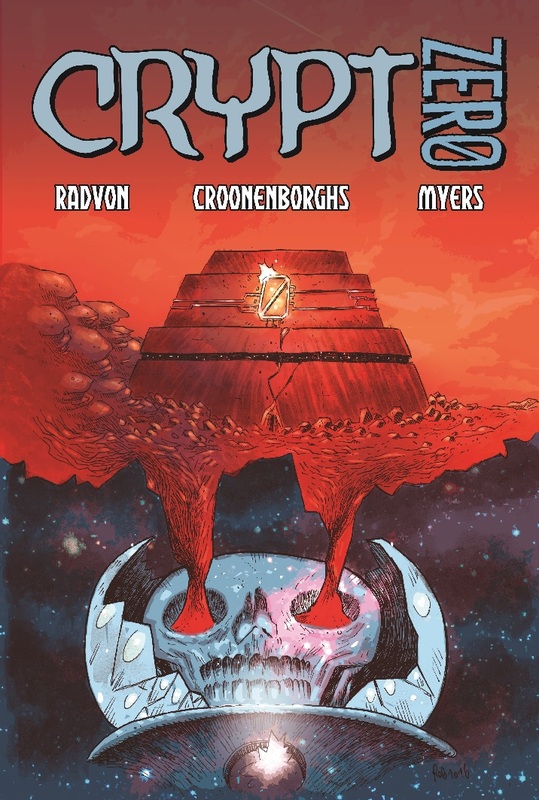 CRYPT ZERO is an independently published comic book written and produced by me, Erik Radvon, with art by Rob Croonenborghs and letters by Micah Myers. Spaceman-for-hire Commander Dal is sent to a remote planet on a scouting mission. He finds an ancient crypt and a whole lotta talking dead things. A pulpy sci-fi thriller in the classic EC Comics tradition. Read CRYPT ZERO for free here! Like what you see? Buy the fancy pants print edition here. 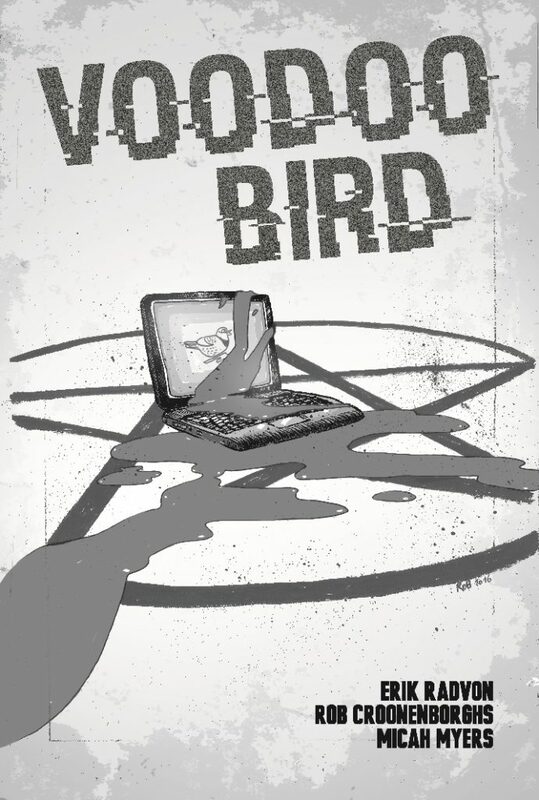 My lil’ comic story VOODOO BIRD is now free to read! VOODOO BIRD is a comic written and produced by me, Erik Radvon, featuring art by Rob Croonenborghs and letters by Micah Myers. Inspired by the long-running “Tharg’s Future Shocks” segment found in British comic magazine 2000 A.D., this short story tells the tale of a hot new app that goes viral and becomes an instant global obsession…with a little help from ancient black magic. It’s Flappy Bird meets Invasion of the Body Snatchers! Click here for your own spiffy digital copy of VOODOO BIRD for FREE! I’ll still gladly take your filthy lucre for a print copy – available here. Another year comes to a close. This was a really busy one for me. I turned 37 this year, and I felt the numerology was in my favor to do some ambitious projects. First and foremost, I put together a team and produced a new comic series called CRISIS VECTOR. Things kicked off in January, and I worked at a breakneck pace to get both issues #1 and #2 through production simultaneously, like Peter Jackson filming Lord of the Rings, but with less New Zealand. The end result: 50-odd pages of full-color glossy comic book adventure spanning time, space, and the soul. I pitched it to publishers, they all said no, so now it is truly forever mine. Honestly, it’s the type of story that only could be mine. The genesis for Crisis Vector was the passing of my grandfather last year, and the benevolent ghost of his memory hung overhead throughout a lot of what I did in 2018. CRISIS VECTOR didn’t come from a place of the brain. When asked “What’s it about?” I often flounder like a fish out of water. I honestly don’t know what it’s about. I just did it. And now it exists, with thanks to fantastic artistic partners Samir Simao, Ross Taylor, and Micah Myers. I originally had CRISIS VECTOR slated as a one-shot, then a three issue miniseries. As I look ahead, I think maybe it will be a quasi-ongoing container for my self-published comic ambitions for years to come. My little sandbox in the graphic novel universe. I have issue #3 mapped out, which I thought would be the conclusion, but it seems to have spawned even more beginnings. That’s life for you. An unexpected assignment came through mid-year, with a chance connection to the editorial staff at Famous Monsters of Filmland magazine. I landed two articles in the esteemed publication founded by Forrest J. Ackerman, tackling RETURN OF THE JEDI and THEY LIVE. I love movies, I love monsters, and I love Famous Monsters of Filmland, so the experience was pure joy. It also rekindled my freelance writing desires, and reminded me how fun it can be. I hope I get the opportunity to contribute again next year. On the personal front, we made some major renovations to our 100 year old New England house. Living amongst a squad of contractors and seeing your home literally ripped apart and slowly put back together again is a next-level kind of stress. Not necessarily bad, but definitely a noteworthy experience. My sense of well-being is disproportionately tied to my physical dwelling (I guess this is a good a time as any to admit I’m a believer in astrology, and I’m almost a stereotypical parody of a Cancer). Gone is our mish-mash of a century’s worth of different exterior materials, the faded white of the house replaced with a clean and cool blueish-grey. Our little barn with its rusty metal roof now looks nicer than the house itself, decked out with smart asphalt singles and matching blue-grey siding. The roof of this place is slate, which requires specialized contractors, basically like masons in the sky. We fixed a bunch of issues up there, too, including repointing our funky chimney. I never anticipated living out an arc of This Old House episodes, but here we are. When not writing, making comics, going to conventions, and juggling home renovations, Jessika and I managed to travel quite a bit. We went to Uruguay in the beginning of the year, visiting Jessika’s home city of Montevideo down at the bottom of the world. I’ve been enough times now that it almost seems familiar. It’s a truly unique place, and Uruguayans have a truly unique culture that is not easily describable or subject to any of the ideas most North Americans might have about South America. If I ever make my escape from the US empire, Uruguay is my likely refuge. My lifelong infatuation with the US Southwest came back with a vengeance this year, and Jessika was kind enough to indulge not one but two trips to the region. First, I was in Las Vegas for a work conference, where I met up with my old Florida buddy Gordon Jonze and romped around the rapidly-expanding city. Gordon gave me a great look at the bizarre underground network of service workers who power the city. Nothing like seeing a place with a local, or enjoying heavily discounted food nearly everywhere. We parlayed Vegas into a trip to the Grand Canyon, Sedona, and Phoenix. On trip #2, we went back to Arizona and spent yet more time in Phoenix, and I spent my birthday in Sedona, one of my favorite places on Earth. Those red rocks are otherworldly, but Sedona proper has gotten mighty posh over the years. As much as I like dining in the same restaurant as GMA’s Robin Roberts (happened on my birthday), I equally enjoy the towns below Sedona in the Verde Valley, including Cottonwood, where I lived for a dazed and confused year in my early 20s. Good wine, good food, good people, and the amazing vistas of the desert. I couldn’t ask for much more than that. The tail end of the year saw the publication of Famous Monsters in October, which served as a kind of fuel injector for celebrating Halloween in a big way. I also landed a prose piece in an upcoming anthology, PROS AND (COMIC) CONS, coming from editor Hope Nicholson and Dark Horse Comics in May 2019. CRISIS VECTOR #1 got picked up as the “Pick of the Week” by Newsarama writer supreme Pierce Lightning on the New Number One podcast. I’ve been connected to Pierce online for years now, and am a big fan of their writing, so I was thrilled by that. I closed out the year by being a guest on the SCI-FI SATURDAY NIGHT podcast, which was a first for me. It was interesting to try to put together the sprawling puzzle of my “career” in a way that makes sense to normal people. Not sure I succeeded, but it was a fun experience and I’m grateful to host Dome and his team for the invite. As I look to 2019, I feel like I kind of want to let my foot off the gas for a bit, sort of coast through the year and make the day-to-day more enjoyable. However, CRISIS VECTOR #3 is nagging at me in a big way, and I read a short story by my friend Ben Joe that for some reason immediately struck me as something that would make a really cool short film. So, with Ben’s permission I took a stab at converting the story into a shooting script. I may try to film this thing in the spring of the new year, adding another expensive and thankless creative output to my agenda. I’d like to write more in 2019, perhaps contribute to a few new anthologies, magazines, or websites. That includes this venue, too. I blogged too infrequently in 2018, and I want to make these kinds of posts part of my routine. I get irritated and angsty when I don’t write, and this is my prime spot to do that. So no one to blame but myself on that front. Not really of consequence to many- but I stopped eating meat around September. Not as a political act or anything, just a personal choice. It’s been good for me. I’m constantly surprised by how little I miss it. Lastly, in attempt to cultivate a more honest and focused digital representation of myself, I’ve cut down on the social media channels. I’m off Facebook and Instagram, solely sticking to Twitter. And on Twitter, I’m making a conscious effort to talk to you all the way I really speak. There’s more than enough “Internet” voice out there and it’s so easy to fall into that pattern (I’m guilty of it). But that’s not my thing. All I can be is me, and that’s what I’ll strive for most in the new year. Hope your 2018 was solid, despite the state of the world, and here’s a virtual toast to a happy and prosperous 2019. Posted in Uncategorized	| Comments Off on Goodbye, 2018.